Be honest: When was the last time you cleaned your washing machine? It may sound odd to clean a machine that’s built to clean things, but washing machines can be really gross. 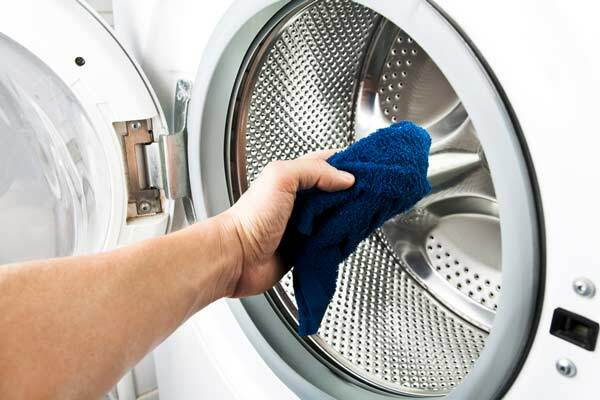 One study found that bacteria like salmonella and E. coli from diapers and underwear is often present in washing machines—and can leech onto what you think are your freshly-washed clothes. The good news is that getting your machine clean—and keeping it that way—is a few spritzes away. The Real Simple Clean Washing Machine Cleaner & Deodorizer smells like a citrus grove and does the hard work for you. Simply spritz the all-natural formula around the interior of the machine, wait 30 minutes, then start your next load of laundry. (The plant-based enzyme spritz won’t harm clothes—and is safe to breathe.) After that, make a habit of spraying after every wash so that the natural enzymes can stave off hard-water minerals, detergent scum, bacteria and telltale black or gray spots. For top-loading washers: Spritz the inside of the machine, let the formula sit for 30 minutes, and run an empty cycle on hot while wiping the outside clean. For front-loading machines: Do the same as above, but first remove hair and debris from the rubber gasket inside the door, and spray and wipe inside the flaps until clean. If your machine has a filter behind the hatch, remove it and rinse off any debris or dirt. For both top-and front-loading machines, use a toothbrush to scrub the fabric and bleach dispensers or remove the drawer and wash by hand. Always leave the hatch open when the machine is not in use. You can find Real Simple Clean at Grove Collaborative, a company that sells natural cleaning and personal care products. In addition to Real Simple Clean, Grove sells its own line of household items as well as many other great brands. Right now, Grove has an exclusive offer for Real Simple readers making their first purchase: a free 3-piece Real Simple Clean set of Hand Soap, Dish Soap, and Multi Surface & Glass cleaner.